How Language Began Everett Daniel L.
Auteur : Everett Daniel L.
How Language Began revolutionizes our understanding of the one tool that has allowed us to become the "lords of the planet." Mankind has a distinct advantage over other terrestrial species: we talk to one another. But how did we acquire the most advanced form of communication on Earth? Daniel L. Everett, a “bombshell” linguist and “instant folk hero” (Tom Wolfe, Harper’s), provides in this sweeping history a comprehensive examination of the evolutionary story of language, from the earliest speaking attempts by hominids to the more than seven thousand languages that exist today. Although fossil hunters and linguists have brought us closer to unearthing the true origins of language, Daniel Everett’s discoveries have upended the contemporary linguistic world, reverberating far beyond academic circles. While conducting field research in the Amazonian rainforest, Everett came across an age-old language nestled amongst a tribe of hunter-gatherers. Challenging long-standing principles in the field, Everett now builds on the theory that language was not intrinsic to our species. In order to truly understand its origins, a more interdisciplinary approach is needed—one that accounts as much for our propensity for culture as it does our biological makeup. Language began, Everett theorizes, with Homo Erectus, who catalyzed words through culturally invented symbols. Early humans, as their brains grew larger, incorporated gestures and voice intonations to communicate, all of which built on each other for 60,000 generations. Tracing crucial shifts and developments across the ages, Everett breaks down every component of speech, from harnessing control of more than a hundred respiratory muscles in the larynx and diaphragm, to mastering the use of the tongue. Moving on from biology to execution, Everett explores why elements such as grammar and storytelling are not nearly as critical to language as one might suspect. 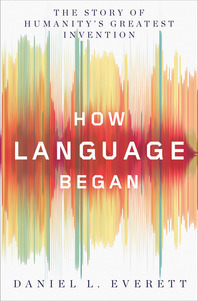 In the book’s final section, Cultural Evolution of Language, Everett takes the ever-debated “language gap” to task, delving into the chasm that separates “us” from “the animals.” He approaches the subject from various disciplines, including anthropology, neuroscience, and archaeology, to reveal that it was social complexity, as well as cultural, physiological, and neurological superiority, that allowed humans—with our clawless hands, breakable bones, and soft skin—to become the apex predator. How Language Began ultimately explains what we know, what we’d like to know, and what we likely never will know about how humans went from mere communication to language. Based on nearly forty years of fieldwork, Everett debunks long-held theories by some of history’s greatest thinkers, from Plato to Chomsky. The result is an invaluable study of what makes us human.